Is there a web site the summarizes the "official" restructuring plans? There are many links there to more detailed position and information documents. Again, I am just going to share parts of what's available at the above link here (although I added a bit of highlighting) and will comment some later. Move to Part Time Offices (October 21, 2016, Washington D.C.) Instead of filling more than 600 vacancies, the National Weather Service announces plans to eliminate the work of local forecasters and distribute forecasts and guidance produced by a Washington D.C. Center. Local forecasts, prepared with the expertise of local meteorologists, will give way [to] automated forecasts based largely on computer models. The plan will lead to a degradation of service with local weather forecast office hours reduced from the current 24/7/365 schedule to part-time and in some cases, possibly seasonal operations. The expertise of local forecasters is critical to the NWS mission of saving lives. Each geographic region has its own unique weather patterns. Local forecasters understand these patterns and apply this knowledge to the computer models. Their intimate knowledge of these weather patterns, the geographic region, the flood prone areas, and the demographics of people whose lives they protect are critical to their lifesaving work. The NWS’s new plans would change the role of the local meteorologist from using their expertise and knowledge of local weather patterns to a “weather briefer” who is no longer responsible for the forecast, but instead disseminates information from the Washington Center. The plan also mentions the use of flexible staffing that could include migrant meteorologists who travel to locations based on severe weather needs; a position that negates the value of local expertise, knowledge of unique local weather patterns, and familiarity with the geographic location and flood prone areas. One of the most critical problems of relying on national center forecasts is the disconnect that would develop between the largely centralized “forecast” and the local weather patterns, cultural, and geographical information that local forecasters provide. Forecasters would be routinely placed in a compromising position of having to choose between a briefing based on an official/centralized forecast with which they disagreed, or briefing based on their own judgment informed by extensive local knowledge. It is the National Weather Service Employees Organization’s stand that the ownership of the forecast must be at the final point of delivery. 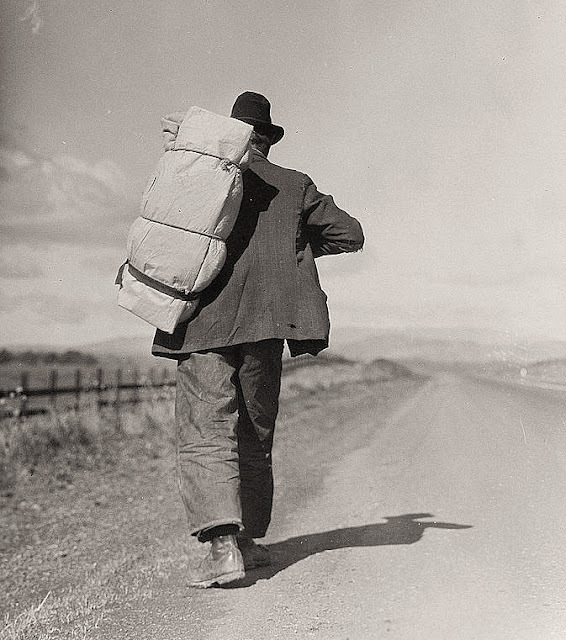 The phrase "migrant meteorologist" caught my attention, and I could easily envision myself as a young, migrant forecaster heading west for my next assignment. Jack Diebolt sent a link to an article in a Palm Beach (Florida) newspaper that appeared last Sunday. The headline is paraphrased slightly above. I am just going to share parts of article here (although I added a bit of highlighting) and will comment some later. I have not been aware of this attempt, but some readers are likely more informed than I. A Herculean overhaul of the nearly 150-year-old National Weather Service is raising hackles as talk of moving local forecasting hubs, cutting office hours and shuffling meteorological duties moves forward. The revamp, no small feat for an organization that just this year was able to incorporate lower-case letters into forecast discussions, is aimed at saving lives during such extreme weather events as hurricanes, according to administrators of the 5,000-employee service. • Reducing staff at some offices while increasing it at others depending on weather events or population, including bolstering some offices during tourist season. • Moving offices so they are closer to emergency operations centers and reducing office hours so some sites are no longer 24/7. • Using more automated systems, such as to launch the twice-daily weather balloons that sample upper atmospheric conditions. • Shifting some forecasting duties to regional offices or national hubs so that local meteorologists can work more closely with emergency managers and municipal officials. Uccellini and Furgione downplayed concerns [voiced by the NWS Employees Union], saying local offices would still be able to provide their own expertise, but could be relieved of the so-called “grid” forecasts that use variables such as temperature, wind and dew point to come up with a final forecast. “If forecasters are locked in to producing grids, it takes away from them interacting with local officials making decisions on the ground,” Uccellini said. 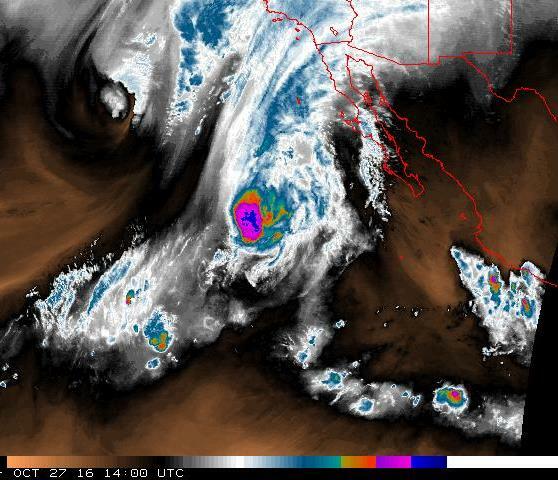 Upper-level outflow from weakening Hurricane Seymore (located west of the south end of Baja this morning) is bringing widespread, high-level moisture and cirrus cloudiness to Arizona today. The water vapor image above is from 14 UTC. Little to focus on re local weather for rest of October. Warm and dry continues, but with today expected to be hot with afternoon temperatures in the upper-90s. Forecast of total precipitation below is from the 00 UTC WRF-GFS on the 5.4 km grid and is valid at 11:00 pm MST on October 31st. Chuck and Vicki Doswell stopped by here yesterday. They are on a long, Western US drive that will eventually take them to the Severe Local Storms Conference in Portland, Oregon. During dinner we learned that Chuck had been honored by the ESSL (European Severe Storms Laboratory) and given the 2013 Nikolai Dotzek Award. The Nikolai Dotzek Award is the most prestigious award in the global severe weather research community. The award is presented at each European Conference on Severe Storms, starting in 2011, for an outstanding contribution to the science of severe storms. The award may be given for a breakthrough discovery presented at the conference, for an accumulation of important accomplishments during a scientific career, or as an encouragement to an outstanding young scientist with great potential. The award may also be given for a combination of these factors. Congratulations to Chuck, and also to the 2011 winner - Paul Markowski, Penn State - and the 2015 winner - Harold Brooks, NSSL. 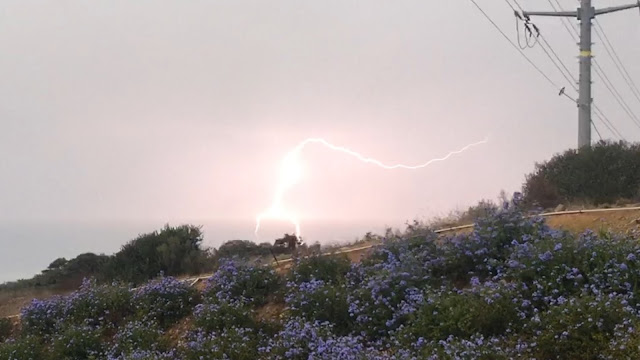 I should have paid more attention yesterday to the early morning, elevated thunderstorms around San Diego (above - looks like hawk on line wasn't watching either). These were feed by moisture from the south coming in above 850 mb. This led to a very active October day from our west to the north (below shows detected CG flashes through 12 UTC this morning), and a narrow band of storms across eastern Pima and Pinal Counties. After several days of excellent forecasts, the WRF runs did not forecast the storms that occurred locally. 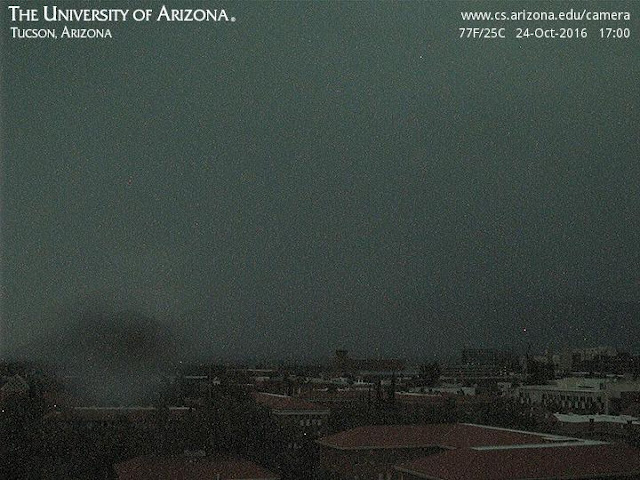 CAPE had developed by the time of the 00 UTC TWC sounding and there were thunderstorms in the area by 4:00 pm MST above. View from campus to north at 5:00 pm below was very dark. The ALERT rainfall data below shows a swath of measurable precipitation from out around Three Points, across parts of the metro area, and into the Catalinas. Heaviest amounts, greater than half an inch, were measured out west of the interstates. The airport and DM AFB had thunder with Traces of rain. Here at house we had thunder, wind gusts of 30 to 40 mph, and 0.04". It was an interesting day here, but much more so far out to the northwest. The WRF model forecasts yesterday were quite good (previous post), keeping thunderstorms mostly south and west of the metro area over higher elevations. 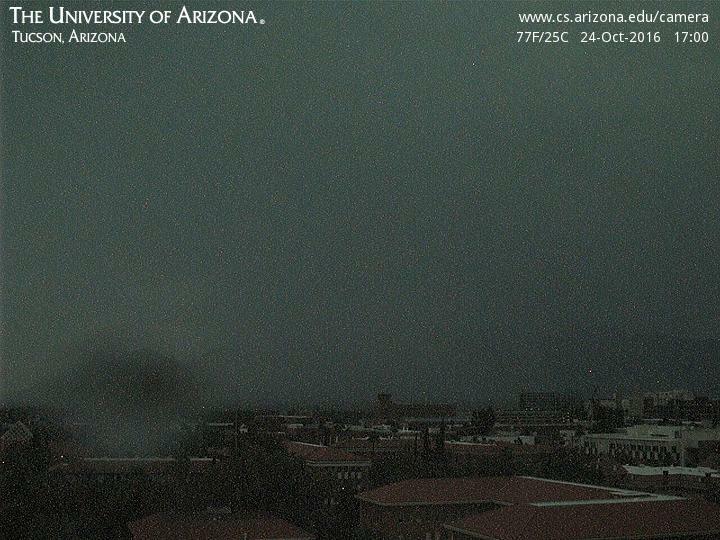 Above graphic shows detected CG flashes yesterday afternoon - essentially from about 1:00 pm MST through 6:00 pm. 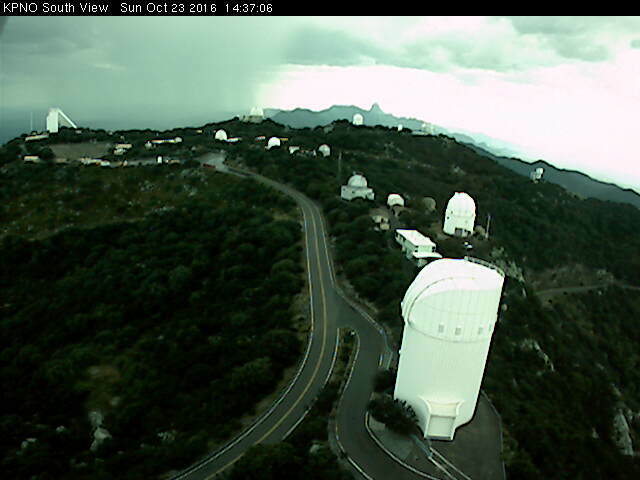 Web cam view below - looking south from Kitt Peak - captured what was the heaviest storm of the afternoon at 2:37 pm located east of Baboquivari. The blended radar/gauge rainfall estimate map second below (from Flood Control District of Maricopa County) indicates that this storm may have produced over an inch of rain. Across the ALERT network in Pima County only 4 sites had rain yesterday - amounts all less than a tenth of an inch. The WRF forecasts from 06 UTC last night indicate only very isolated convection this afternoon from the Santa Ritas up across the Rincons - and this only in the NAM version of the model. The morning sounding has no CAPE at TWC, as middle-levels have warmed, killing what little CAPE was around yesterday. Finally, the long range model forecasts were indicating an active period to close out October - see "Unsettled" post three below. But, now those models keep Arizona and New Mexico mostly dry through the end of the month. The forecast below is from the 00 UTC WRF-NAM on 5.4 km grid for total precipitation through 5:00 pm on October 31st. The light precipitation indicated over southern Arizona actually was forecast for the first 6-hours of the forecast period. Looks like fair, warm to hot conditions will prevail through Halloween - assuming these latest forecasts verify. Although the thermodynamics are marginal, both WRF models from 06 UTC forecast afternoon thunderstorms over eastern Pima County today. The forecast of composite radar above is from the GFS variant and is valid at 2:00 pm MST today, while that below is from NAM version and is for 3:00 pm. Both models forecast small CAPE values of less than 500 J/Kg, but the situation is helped along by cold, middle-level temperatures (e.g., 500 mb temperatures of -10 C or less). The forecast skew T for TWC (at bottom) is from the WRF-NAM and is valid at 2:00 pm. The bulk of the CAPE occurs at temperatures colder than 0 C, and weak updrafts can produce considerable ice, lightning, and high reflectivity. The southerly winds at lower levels result in a slight increase in PW during the day, and high cloud bases could result in some gusty outflows. Thunderstorms have developed this afternoon to our south. Above is the composite radar chart for 4:38 pm MST and below shows detected CG flashes through 4:00 pm. The 12 UTC WRF-GFS actually forecast storms this afternoon in eastern Pima County and Cochise Counties. Nice sunrise this morning - Saturday October 22nd. Several 500 mb short waves will affect the Southwest during next 10 days and subtropical moisture has been inching northward. The GEFS plumes from 06 UTC last night (below) forecast slight chances for showers tomorrow into Tuesday. The operational GFS (blue), which is formulated differently than the GEFS members, is a serious, wet outlier. I've looked at the WRF-GFS from 00 UTC last evening because it runs out to 7 days (but, I don't know what the GEFS plumes were from that run). Regardless, above is the forecast for total precipitation through 6:00 am MST on Tuesday morning. Things get more interesting later in the forecast period and below shows the forecast of total precipitation through 5:00 pm on Saturday October 29th. If this were to verify, October would close out with a significant and widespread precipitation event for Arizona. These two forecasts from the same run illustrate some of what the model brings into confluence over Arizona. Forecast above of PW shows a significant intrusion of high PW up the GoC and into Arizona at 4:00 pm on the 28th, with amounts well over an inch. At the same time (below) the model indicates a fairly strong short wave to be moving into Arizona and northwestern Mexico. Again, this would be a very interesting, and welcome, end to the month, were the forecasts to verify well. The forecast above was from the 12 UTC WRF-GFS yesterday morning and was valid at noon. The easterly wind layer apparently remained very shallow through this event and did not reach high enough to force high winds at Mt. Hopkins. The max gust up there yesterday was only 31 mph, while the airport reached 30 mph. Early this morning the airport was still having gusts to around 30 mph, while wind had diminshed to only 15 mph. An interesting situation that may indicate that easterlies need to be as deep as the mountain massif, i.e., reach to around 700 mb if a high wind situation is to develop. The grid point forecasts were quite good, see previous post, although gusty winds at airport have continued longer than were forecast. I have been studying (with some inputs from John Brown in Boulder) the high winds that occur occasionally, from the east, at the Mt. Hopkins RAWS site (as well as at other weather stations on the F. L. Whipple Observatory Complex). These appear to be caused by the terrain configurations of the Santa Rita Mountains, which lead to high speed gap winds because of the sky island's large massif blocking the synoptic winds. Mike Leuthold has added a sounding point to the WRF model output that is just upstream of the Santa Ritas - the skewT forecasts labelled "Sonoita" are located along Highway 83 about a mile north of the Sonoita junction. The models have been forecasting an east wind event tomorrow for almost a week now, and I want to examine the situation in this post using the 06 UTC WRF forecasts from last night. The view above is looking west toward the Santa Ritas from about the point used in the WRF for the Sonoita sounding. Mt. Wrightson is the highest peak of this sky island at 9452 ft MSL. The very large and deep saddle (Riley Saddle) to the south (left) of Mt. Wrightson is immediately upwind from Mt. Hopkins and provides a large gap that probably accelerates blocked flow. Mt. Hopkins is physically separated from the main massif and principal ridge-line of the Santa Ritas, adding to the complexity of the situation when winds are from the east. These two graphics show the Whipple Complex with the main features identified - satellite view above and terrain map below (thanks to Carl Hergenrother for these figures). 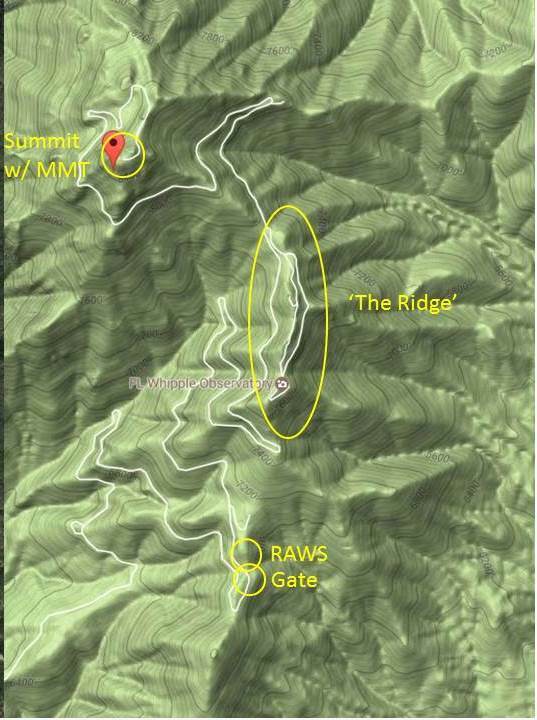 The RAWS station is considerably lower than both the Observatory and the MMT telescope at the summit. 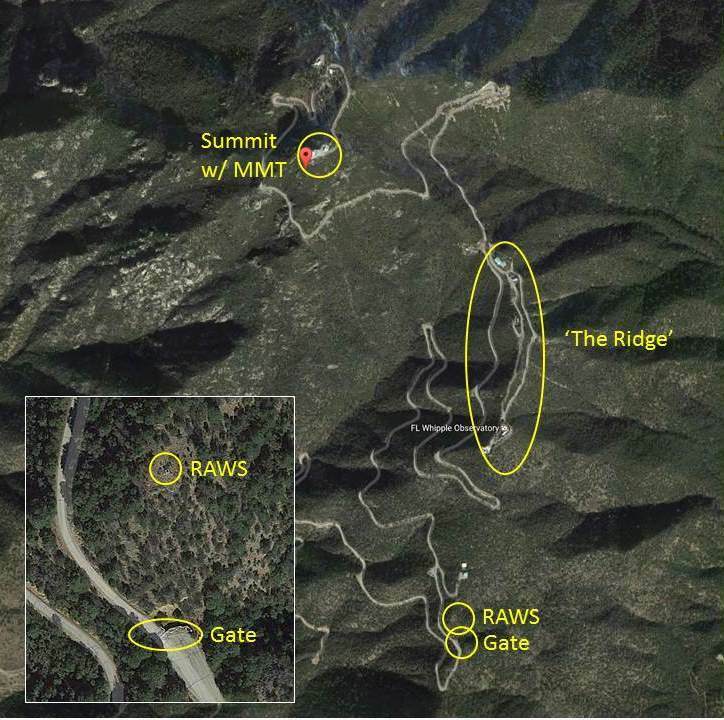 The terrain at the Observatory is obviously very complex, and there appears to be another gap just to the east of the RAWS site. The two forecasts here are for 10-m winds from the 06 UTC WRF runs at Atmo. Above is from the WRF-NAM valid at 10:00 am MST tomorrow morrning, while the WRF-GFS forecast below is valid at 9:00 am. Both forecasts show blocked flow accelerating around the sky islands of southeast Arizona with light winds at the highest elevations, as per Mt. Lemmon and Mt. Wrightson. Finally, I looked at the hour-by-hour NWS grid point forecasts for Mt. Hopkins (above) and for TUS (below). Whatever algorithm is used to generate these forecasts (probably driven by the operational GFS) ends up forecasting max wind gusts of 31 mph at both sites, which is probably not very likely - but we will see what tomorrow brings. While I only have a simple point-and-shoot digital camera, I couldn't resist a shot of the setting moon this morning. Nice morning with enough moonlighting that I could head out a bit earlier than usual. The 00z forecasts from the WRF-GFS at Atmo are indicating strong east winds late in the week, especially next Thursday night. The graphic above is valid at 1:00 am MST next Friday morning, the 21st. I am interested in whether the WRF model can forecast the potential for high winds at the Mt. Hopkins RAWS station and the Whipple Observatory complex out at such a long range. Even though a fairly strong front comes by, there is little moisture avaiable and the WRF-GFS forecast for precipitation (on the 5.4 km grid) through 5:00 pm next Saturday is shown below - very dismal if one is hoping for a bit more October rain. The GEFS 500 mb forecasts for a week from now (valid time 00 UTC on 22 October) are interesting in that the most uncertainty occurs over the continental U.S. The above shows the spaghetti plot for the various members forecast of 500 mb heights at that time. Here are two of the ensemble member forecasts. The forecast above features a deep trough over the eastern U.S. and an anticyclone over northwestern Arizona. However, the member forecast below features a cutoff low over Arizona and a weak ridge over the eastern U.S. What will actually happen? We'll check back several times during the coming week. Very nice, cool morning here with a low at house of 49 F vs 59 F at the airport. It was noticeably cooler down along the Rillito when I walked at sunrise. of 92 mph (148 km/h) and a gust to 122 mph (196 km/h). Took a quick look at the WRF-GFS forecasts from 00 UTC last evening at Atmo - found little change. The dry atmosphere we had at 00 UTC last evening (above) continues with little change through 5:00 pm MST on the 19th (below) - although drying is forecast to affect lower latitudes to our south and southwest. The forecast of total precipitation through the 19th (bottom) indicates the weather action stays well to our northwest, as cool season, atmospheric rivers begin to impact northern California, bringing very heavy amounts to the mountains there. For more information on the strong storms that are about to impact the Northwest, see Jim Steenburgh's post this morning - link at right.